We cleared Vancouver easily leaving via Stanley Park and onto the “Sea to the Sky” highway through Whistler, venue of the recent Winter Olympics. The road was twisty with wonderful views all the way to Lillooet where we took the opportunity to re-fuel and have a cup of coffee; there were 8 different blends to choose from, in the local gas bar as they are known in these parts. 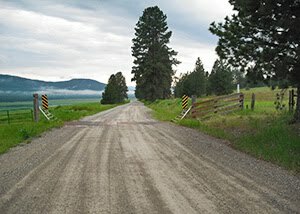 When we reached the town of Clinton we headed onto some wonderful gravel roads heading north to the town of Williams Lake. We stopped and chatted to some locals on the road only to find out that one of them was the person in charge of roads for the area who gave me her card and asked me to remind her when the event is coming and she will try to make sure the gravel is in pristine condition. We re-joined the tarmac road at Williams Lake and then headed north to our hotel for the evening in Quesnel. For those crews wanting an all tarmac option then the route is slightly longer but you have the chance to stop for lunch at the Corral Restaurant in the town of 70 Mile and meet Joan Zelmer who will certainly brighten your day. Leaving Quesnel we headed west and straight onto gravel roads, for those who want to use them, heading up the “Blackwater Highway” all the way to a stop for a very nice lunch in Fraser Lake. The gravel roads were in great condition and we didn’t see another vehicle all morning. The alternative tarmac route goes via the largest town in the region, Prince George, and is a little longer but well surfaced and almost traffic free away from the towns. One final gravel section was looked at after lunch and then we used highway 16 into the Bulkley Valley and the town of Smithers for the night. Smithers is surrounded by the Bulkley Ranges and there was fresh snow on the tops when we left the following morning. Our original plan had been to look at the gravel roads between Smithers and the town of Terrace a little further to the west. Local information suggested that the roads were not in good condition after a hard winter and this proved to be the case as we punctured both rear tyres and had to be recovered to Smithers where we swallowed hard and paid to have some proper 10-ply all terrain tyres fitted to make sure we completed the journey. With the roads in a bad condition we decided to change our planned route and head directly from Smithers to Watson Lake missing out a night in Terrace. 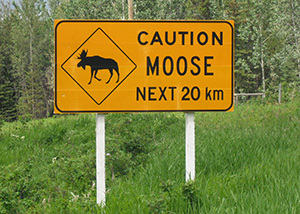 This made sense as we continued to head north all the time rather than west. On the way we tried the gravel tyres on a loop off the main road near New Hazleton, those wanting to stay on the tarmac can simply continue on the main road, then headed north up the “Cassiar Highway”, now all newly surfaced, stopping off at a café and gas station in Bell II where the fuel pumps were disguised in stone and the hotel sold bells which you apparently strap to your body so that any Grizzly Bears minding their own business in the woods are not startled by your sudden appearance as they hear the bells first!! The run to Watson Lake was a long one, over 500 miles, but there was no other place to stay which could accommodate the whole rally. 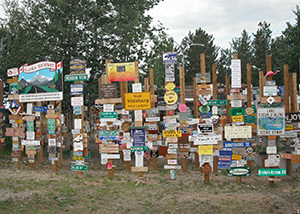 At Watson Lake we checked the available hotel options, the largest one named after the town burnt down last year, then took some photographs of the amazing Signpost City, where travellers from all over the world have left signposts to their home towns. One read “Alaska or Bust” a most appropriate thought for our journey. Leaving Watson Lake there were two very different route options. For the more adventurous there is a wonderful drive on mostly gravel roads via the “Robert Campbell Highway” to Ross Lake and then the “Canol Road” to Johnsons Crossing to re-join the tarmac. The “Canol Road” was constructed during the Second World War by the United States Army Corps of Engineers to build and service a pipeline bringing oil from Norman Wells to a refinery in Whitehorse, Yukon. Though built at huge expense, the pipeline suffered from shoddy workmanship and technical difficulties. It was abandoned after only thirteen months of operation. The steel pipe was salvaged, but abandoned trucks, pump stations and buildings remain along the trail. The all tarmac, shorter, route goes via Teslin Lake with an opportunity to stop for lunch and watch the fisherman on the pier. Our stop for the night was the city of Whitehorse, the capital of the Yukon Territory. On the rally crews will enjoy a well earned rest day. Whitehorse has many attractions for the visitor, museums, boat trips, walking tours, floatplane rides and even a golf course so the rest day should be a busy one. In the evening there is a great show called the Frantic Follies, a vaudeville revue, if you want a change from the normal routine. From Whitehorse we continued to head north up the now all tarmac “Klondike Highway” and into the heart of the gold rush country and the town of Dawson City. 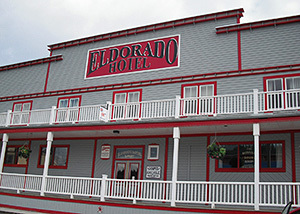 Arriving in Dawson is just like stepping back in time to the end of the 19th Century. The streets are unpaved and all the buildings look like they have stepped straight from a John Wayne movie. Luckily our hotel was just old looking on the outside but very nice and modern on the inside with all the usual facilities required. We will spend two nights in Dawson as there will be an optional 100 mile gravel loop to drive in the morning and then a chance to enjoy the delights of Dawson in the afternoon. Crews opting not to do the gravel loop can enjoy another restful day spending money or even panning for gold in the river where the 1896 gold rush began. In the evening there will be a chance to lose the gold money earned during the day with a visit to Diamond Tooth Gerties, a casino with a difference as all profits are invested in community attractions and visitor services. 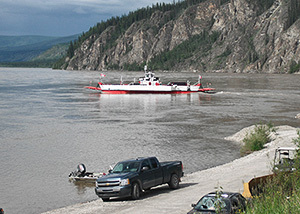 We woke to a lovely morning after heavy rain during the night; it was amazing how quickly the dirt streets dried out, but my thoughts were on how high the Yukon River was as we queued for the George Black Ferry for the short crossing on our route into Alaska. The ferry was another free one paid for by the local government and we were very quickly across and on our way over the “Top of the World Highway”, so called because you are running on a ridge with stunning views on both sides. 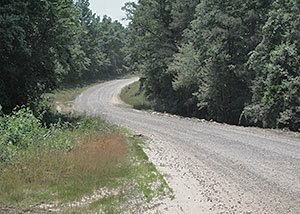 The road is mainly gravel, very well maintained, and all cars will need to use it as there is no other option. The border was reached before opening time so we talked to some other travellers including a retired couple from Wyoming who thought our planned route was wonderful and were very happy that we had taken the time to see as much of Yellowstone as we did. Once the border opened, at 9.00 Yukon Time 8.00 Alaska Time, we were looked after with the usual efficiency and courtesy and were on our way in less than 5 minutes. The border area has a sign proclaiming that it has a population of 2 which must swell to at least 10 during the few months this border crossing is open. The road after the border was again gravel until the small town of Chicken in Alaska where we have promised to stop at the Chicken Creek Café for a late breakfast. You should have seen the size of the Hot Cakes our retired friends from Wyoming were eating as we left. Chicken was supposed to have been called Ptarmigan after the local bird but the first inhabitants couldn’t spell Ptarmigan so Chicken it became. After Chicken the road becomes fully paved and it was then a fast run to our hotel in the city of Fairbanks. Our hotel in Fairbanks is a resort which includes a wildlife centre, bird spotting areas and even a wonderful museum full of pre-war American built cars including a Cord. We were introduced to Willy the museum curator and he has promised any interested crews a full tour of the museum and restoration workshops. As we left Fairbanks for the final run to Anchorage we wondered what the last day of the trip would bring as there are no route options but the main road. Our first surprise was a café we stopped in at Nenana. This was run by Joe a former US Navy officer from Florida who is a car nut, he has owned an XK150 in his time, and the walls are lined with photographs of 1950s and 1960s American Muscle Cars. Joe has insisted we stop there on the event so he can add more pictures to his wall and thinks the sight of some lovely old cars parked on the main street will be wonderful for the town. Continuing south we entered the Denali State Park where the views of Mount McKinley were awesome. We thought we needed yet another cup of coffee by this time so stopped at the McKinley View Restaurant where we could sit and stare at the mountain. The owner has invited us to stop there on the rally where crews can get a lovely home cooked lunch and has promised us that she will have a new outside deck built by next year so we can sit outside and enjoy the scenery, weather permitting of course. The final run in to Anchorage was on a 4 lane highway but we did not need to navigate round the city streets as we found a superb finish location on the main route in with a large parking area and easy access to the International Airport for the flights home. As we sat in the hotel bar enjoying a well deserved beer later that evening we wished we could be flying out from Anchorage, unfortunately our hire car has to go back to Seattle so we have a long journey ahead of us but with so many memories of where we have been over the past month that we will have something to talk about all the way back. We left Great Falls on a grey morning and headed west crossing the Missouri River which was running high and fast. A fast run up Highway 89 took us to the optional gravel sections of the day starting near Bynum and then continuing via Heart Butte to a coffee stop in East Glacier, the archway opposite the café calls itself the “Gateway to Glacier National Park” We climbed Looking Glass Hill and got our first glimpse of the majesty of the mountains in the park. A lovely run up the hill took us to St Marys and the entrance to the “Going to the Sun Road” which runs right through the park. Unfortunately the winter has been very bad in this area and the snow was late and deep so not all of the road was open, we hope it will be when we return on the event. We followed the Park Rangers advice and drove a little further north to investigate “Many Glacier Road”, an area famous for numerous lakes and waterfalls and were not disappointed as the views were incredible. We later met a local who considered this to be his favourite area in the park and is usually open earlier in the year than the main road through. We then used Highway 2 which skirts round the south of the park and stopped for lunch at the “Halfway Motel”. The owner told us of his very recent sighting of a “blonde” Grizzly Bear in the area to the rear of the café and later sent some photographs. We also sat and watched deer and even Hummingbirds flying around while we enjoyed some great home cooking. On our run in to the town of Kalispell for our overnight stop we just had to do a bit of train spotting and we sat and watched a huge freight train go past with 3 engines pulling and 2 pushing, it seemed to last forever and must have taken at least 2 minutes to pass us, incredible. Leaving Kalispell the next morning we drove west through the Flathead National Forest and past the Lost Trail National Wildlife Reserve using some wonderfully smooth gravel roads, crews who want to avoid this can do so by continuing on Highway 2. Then it was into the Kootenai Forest before heading through the town of Libby before turning south into the Cabinet Mountains and a lunch stop at Little Joe Montana, another great family run restaurant who regularly look after touring groups. As we left the restaurant the owner told us to call in to look at the Ross Creek Giant Cedars many of which are as wide a car and many hundreds of years old. Photos did not do them justice, you will have to go and have a look for yourself. We finally left Montana and crossed into Idaho as our route for the rest of the day followed the top of Lake Pend Oreille to finish in the resort town of Coeur d’Alene on the shores of the lake of the same name. We plan to stay in the resort spa and golf hotel which is located on the banks of the lake where the amount of activities available are just staggering, you can even take a seaplane flight from the lake. The great thing is that crews will have a rest day to try and sample as many f these delights as possible. Leaving Coeur d’Alene we used the Interstate to cross into Washington State, the last of the “Lower 48” we will visit and through the city of Spokane before heading into the wonderful scenery of the Spokane Indian Reservation and the Camas Valley before crossing the Columbia River and Franklin Roosevelt Lake on the Gifford Ferry. This is a free service which takes about 15 cars across the river at one time; as usual we took the opportunity to talk to some locals about road conditions and the best route to take to the border with Canada. The Franklin Roosevelt Lake is the reservoir of the Grand Coulee Dam which was completed in 1942 and is the largest electricity power generator in the US. We continued westwards on traffic free back roads through the Colville Indian Reservation and then turned north to the town of Republic where there were many cafes in which to enjoy a quick lunch stop. Then it was over the Wauconda Pass and through the town of Tonasket before we found some superb gravel roads to end the day. A final short trip took us across the very efficient US/Canada border just north of Oroville and in to Osoyoos for our overnight halt. Osoyoos is a lovely little resort town at the northern end of the lake that shares its name and the hotel we have chosen sits on the lake with spectacular views of the mountains as a backdrop to an evening cocktail on the terrace. Osoyoos is also in a famous wine growing region so there will be an opportunity to sample some of the local produce from the hotel’s excellent wine list. The run from Osoyoos to Vancouver was an easy one using the main road between the two points. The views leaving Osoyoos though were wonderful and we stopped to drink in the scenery before heading into the big city. Along the main road there are many wine producers and crews should have plenty of time to visit some of these and purchase the local specialities as this will be a relaxed day on the rally itself. We headed along the highway into Vancouver, the city seems to begin about 60 miles out, and although the traffic was heavy it kept moving. The good news is that it will be a Sunday when we use this road on the rally so there should be few problems for even the oldest vehicles. The highway took us to within a few miles of the hotels we plan to use on the waterfront in Vancouver and the run in was simple. Vancouver is a lively, bustling city so there will be plenty to do on the rest day planned. Or you can just relax before the final leg of the journey north. We leave Vancouver in the morning to head northwards into the wilderness of British Columbia and on to Alaska. Our day in Page started with a trip to the local airport to check on the availability of flights into the Grand Canyon. There appeared to be a large choice for those wanting to make the trip both on fixed wing and by helicopter. We also checked on the boat trips on Lake Powell and found these were also readily available so there will be plenty to do on the day off, unless you just fancy lounging by the swimming pool or doing your laundry. From Page we headed west out of the town and then onto a superb gravel road through Cottonwood Canyon with the rocks turning redder as we drove further in. The gravel road route is much shorter than the optional tarmac road and is smooth enough for almost any car, if taken at a sensible speed. Once away from the canyon we drove into the Bryce Canyon National Park before heading north through the Dixie National Forest, Antimony and Nephi to a lovely drive over the all tarmac Nebo Loop which goes round the snow capped Mount Nebo at a mere 11,980 feet. It was then a short hop on the Interstate to our hotel for the night at the town of Provo just south of Salt Lake City. Provo is home to the Brigham Young University so is a lively student town. The next morning we left Provo for the run on the Interstate through Salt Lake City. On the rally we will do this journey on a Sunday when there will be little traffic. 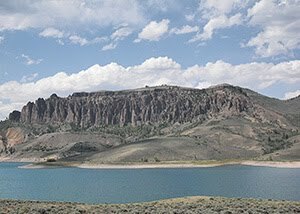 We then found a newly graded gravel road to use near East Canyon, touring crews can stay on tarmac all the way as usual, then on northwards and through the wonderful Logan Canyon which ends with breathtaking views of Bear Lake. 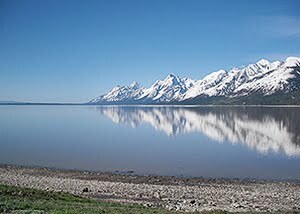 We kept to the west of Bear Lake and entered Idaho before stopping for lunch at a great café in the town of Paris; the café was opposite the Paris Tabernacle a famous old church and well worth a visit. The lady who owns the café is shortly going to visit London so we had a long chat about home before an excellent local meal. She will be happy to see any crews who want to call in next year and I have promised to put a note of her place in the route notes. The rest of the day was spent crossing into Wyoming and the journey north to our hotel in the ski resort of Jackson. Jackson is a lovely town with a lively town square and many fine old buildings. Everyone should visit the Million $ Cowboy in the main square and enjoy a drink at the bar sitting astride a genuine saddle, a very different way to enjoy a beer. From Jackson we headed into the wonderful world of Yellowstone National Park. We stopped first at Old Faithful to see what time the next eruption was only to be told that Beehive Geyser was due to go off in 10 minutes and that it is often more spectacular than the old master. Well everything the park ranger said was true, almost to the minute Beehive started to gush hot water and steam into the air in a display which lasted a full 3 or 4 minutes, I took a few photos but these can not do justice to the real thing. 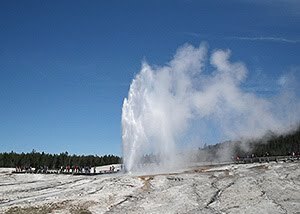 We stopped for a cup of coffee in the café near the geysers, a real surprise as prices were far lower than in normal tourist destinations, before deciding to do a complete tour round the central loop of the park arriving back at Old Faithful in time for lunch. 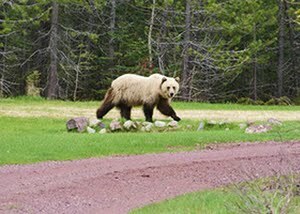 On the trip round the loop, an excellent tarmac road with speed limits of 45 mph in many places and 35 mph in some, we saw Wolves, Buffalo and a very large Brown Bear. You can always tell when there is anything to see as the traffic suddenly stops and everyone jumps from their cars with cameras at the ready. After lunch we then headed out of the western entrance of the park into Montana and on to our stop for the night in Bozeman, another university town. We left Bozeman in the first rain we have seen on the trip, although this quickly cleared to leave a cool day. We first explored some roads to the north of the town and found a fantastic gravel section which is currently being re-graded and should be finished well before next year. We also drove over a lovely tarmac alternative, away from the major highways but through the most magnificent Montana countryside, no wonder it is often called the “Big Sky State”. We finished the day with even more superb traffic free gravel skirting the Helena National Forest to finish in the town of Great Falls for the night. Crews wanting an all tarmac alternative will find the road through the Lewis and Clark forest a delight with little traffic and wonderful views. Great Falls is the gateway to the Glacier National Park which is where we are headed tomorrow. We left Eureka Springs on a lovely sunny day for the long drive to Dodge City in Kansas. We began by heading west and crossed into Oklahoma. Near the town of Chelsea we used a small part of the historic Route 66, the only time we will see this particular road on our journey, and celebrated by having a cup of coffee in the Prairie Rose Grill on the roadside. We continued our journey as quickly as possible through the Tornado Belt bypassing the recently damaged town of Joplin and then entered Kansas near to Arkansas City before a run north west through Medicine Lodge, this is in the heart of Comanche country, and on into Dodge City. We spent some time looking around the Boot Hill historic town exhibition, complete with gunfight (simulated for the visitors of course) then ran into a group of MG owners driving to Reno who were staying in the city overnight. Leaving Dodge City the following morning we continued the long journey through the mid-west as quickly as we could going via Ulysses and into Colorado and our first optional gravel section. A superb section running North West from Pritchett through the Comanche Grasslands. As always we have found a nice tarmac alternative for those who just want to tour. A final section running alongside the Colorado Canal bought us to Pueblo and then on to I-25 for the short journey north to Colorado Springs and our stop for the night. In Colorado Springs crews will have the opportunity to visit and drive up the world famous Pikes Peak if they would like to. There are a number of conditions attached by the park authorities though; firstly there is a toll to pay for using the road, secondly there is a 15 mph speed limit and drivers must take at least one hour to complete the climb or they are fined. Pikes Peak has also been tarmaced for about 80% of its distance and only remains gravel above the tree line. For those crews who would prefer to relax there is much to see and do in the area. 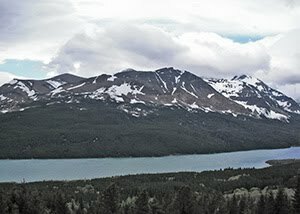 As we left Colorado Springs there was an air of excitement in the car as we headed into the amazing scenery of the Rocky Mountains. There are many superlatives which could be used; amazing, breathtaking, stunning, fantastic and awe inspiring, all of which were used at least 10 times during our run to the lovely old mining town of Durango. We also managed to fit in at least two wonderful gravel sections for crews to drive if they want to, both through such magnificent countryside, before dropping down from over 11,000 feet into the town of Silverton and on into Durango. As we drove down the road into Durango we passed trains of the historic Silverton to Durango Railroad, still using original steam trains and carriages from the towns mining heyday. Our hotel is close to the station so crews can always enjoy a short train ride before dinner. Durango was experiencing one of those fantastic Colorado days when we left the hotel, cloudless blue sky with a little chill in the air, wonderful weather for our drive west via Cortez into the Navaho Nation and Utah. We found a great selection of gravel back roads though canyon country on the way to Blanding before a run west and then south using the state 95 and 261 roads and into Glen Canyon. The road suddenly becomes gravel, there are numerous hairpin bends and the most jaw dropping site as the countryside spreads out below you, everyone was stopping to take photographs and just soak up the spectacular view. The gravel only lasts for 3 miles and is very smooth so everyone should be able to manage it. 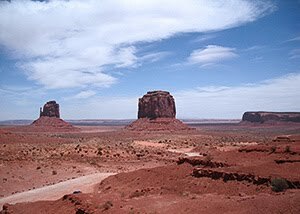 After leaving the canyon area we headed south west towards one of the highlights of the trip so far, Monument Valley, made famous in just about every cowboy film ever made. We are planning to have lunch in the restaurant overlooking the valley with wonderful views of the incredible rock formations. Crews can also either drive the 17 mile road through the valley, a bit rough in my opinion, or take one of the organised tours in a 4x4 vehicle. Our day finished in the town of Page in Arizona on the shores of Lake Powell and where flights into the Grand Canyon can be arranged, something we will investigate tomorrow. We headed west away from the New York area on a beautiful sunny day leaving New Jersey behind and entering Pennsylvania before a quick stop for fuel and breakfast in a truck stop, how many ways can you serve an egg? Once we were in Pennsylvania we left the Interstate and headed into the back roads, suddenly the traffic disappeared and the clean and tidy homes of the locals were scattered around instead. 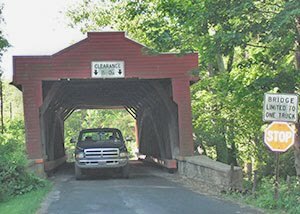 This was “Bridges of Madison County” country and we made sure the route included at least one for a photo opportunity. A little more Interstate followed to get us around the town of Lancaster then it was back into the countryside and more empty roads on the way to Gettysburg for a look around one of the many museums and a chance to re-fuel both the car and the body, there is a great choice of restaurants in the old town area. 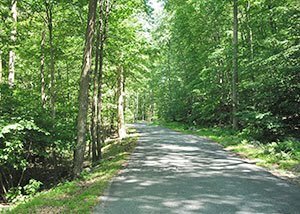 We left Gettysburg via the main battlefield area; the wooden barricades used are still in place in many areas, to head into Maryland for a run through the Catoctin Mountain Park before stopping overnight in the town of Frederick close to the border with West Virginia. The next day dawned hot and sunny as we headed through a part of West Virginia before crossing into Virginia, our 5th state in 2 days, and on to the Skyline Drive, a fabulous tarmac road run through the Shenandoah National Park, part of the Blue Ridge Mountains. 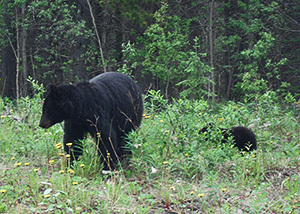 The $15 toll was a cheap price to pay when we saw a Black Bear walking along the road together with numerous birds of prey and even wild Turkeys. We continued our drive along sweeping tarmac roads on the Blue Ridge Parkway through the George Washington Forest before encountering our first gravel section of the event near Buena Vista. A final run through empty Virginian country lanes led us to the incredible facility at Virginia International Raceway. We are currently in discussions with the circuit management about how we can best use the facilities but the plan is to have competition on both the evening we arrive and the next morning as we leave. The next morning we headed west away from the circuit skirting the towns of Danville and Martinsville before heading into North Carolina and re-joining the Blue Ridge Parkway before stopping for lunch in the town of Jefferson close to the Tennessee border. After lunch it was into Tennessee and back into wonderful scenery as we drove through the Cherokee National Forest, part of the Appalachians, and then headed west through Sevierville, the birth place of Dolly Parton, to out overnight halt in Knoxville, a former host of the Worlds Fair. We left Knoxville the next morning on a very hot day and continued our journey westwards through the lovely Tennessee countryside before joining the Interstate, one of the few we will use on our planned route, going via Nashville and on into Memphis for our overnight stop at one of the many excellent hotels in downtown close to Beale Street, a well known name for all part lovers everywhere. Leaving Memphis the next morning was a real surprise as there was little traffic and we stayed close to the road we needed to head west, crossing the Mighty Mississippi and into Arkansas for the rest of the day. A run through the flat Arkansas countryside, watching the antics of the crop sprayers in their small planes and wondering how good their nerves were, led us to another excellent gravel section, there will always be a simple alternative tarmac route to avoid these if you want, and to lunch in the area of Greers Ferry Lake. The afternoon was then one of the highlights of the trip so far as we ran through the Ozark National Forest; we managed to find some outstanding gravel roads here as well, before arriving at a wonderful town called Eureka Springs close to the Missouri Border. Eureka Springs is an old 19th century town with a wonderful hotel in the centre, built in 1896, and a lovely collection of old stores to look around and swap some dollars for goods in. The final surprise of the evening was a meeting in a local bar of a lady who was able to give us the phone number of the local mayor who is a great motoring enthusiast so we can expect a very warm welcome when we return. Today we are continuing the journey westwards and plan to go through a part of Oklahoma before entering Kansas and heading to an overnight halt in the world famous town of Dodge City.